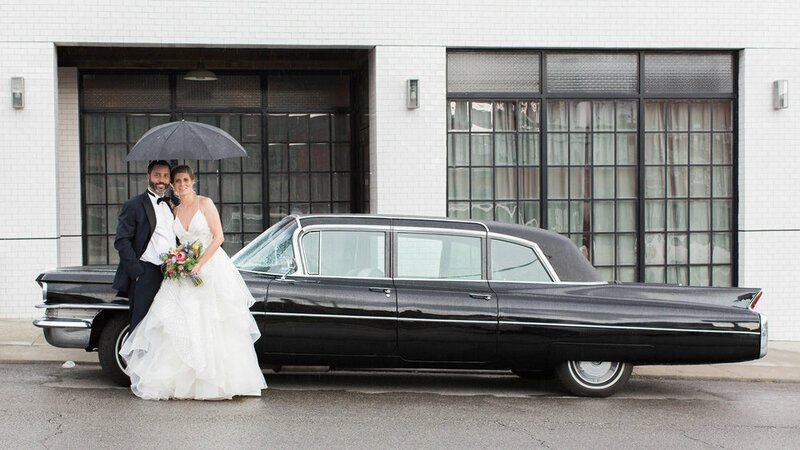 Located in the Creative Crossroads district of Kansas City, The Guild is a uniquely malleable space suitable for a full range of occasions, including weddings, fundraisers, corporate and private parties. The Guild includes a 6,500 sq. ft. indoor space with a large open ballroom, a lobby/loft area that is perfect for your cocktail hour as well as a private 5,000 sq. ft. urban garden adorned with café lights. A breath of fresh air in the middle of the city, the outdoor green space can be used for picnics, garden ceremonies and more, with parking in abundance nearby. The interior venue radiates a distinct vintage charm with polished original concrete floors leading to exposed brick walls and 12-foot windows. A 20 ft. hangar ceiling sports a stunning salvaged 12-foot chandelier centerpiece in front of a beautiful custom bar. Floor-to-ceiling subway tiles complement our large family-style tables constructed from reclaimed timber to complete the look. The lobby/loft areas pull in more brick with wooden accents and modern steel railings to add to the amazing look of your event. The space is an open canvas for whatever design you can imagine! Rental of the event venue also includes use of the garden space, accessible parking, a prep kitchen, bridal party rooms, tables, chairs and linens, as well as usage of the built-in bar and glassware. Security, bartenders, set-up and break-down services are also included. The Guild's indoor venue boasts a capacity of 250 seated guests (general) up to 300 guests (cocktail-style). The outdoor garden area holds up to 250 guests for a seated ceremony. The lobby/loft space is perfect for a cocktail hour or smaller indoor ceremony. The guild provides one off-duty KCPD officer as security for all weddings and events starting after 5 PM. This officer patrols the parking areas and ensures orderly behavior in the venue. Beverage packages, catering, appointments & booking, storage, event timing, décor and more. All beverage packages are subject to Missouri state sales tax. The Guild provides trained, licensed bartenders. We determine the number of bartenders required for adequate service based on the size of your event. We offer two options in regard to bartender gratuity: if you allow tip jars to be out the evening of your event, you do not owe a fee. If you choose not to allow tip jars, we then charge a 5% gratuity fee based on your bar package total. Beverage packages are priced per person for guests over 21 years of age. All bar packages include up to 5 hours of service, bar stations, glassware, napkins, ice, mixers and other necessary bar items. We do have a large variety of beer and alcohol options so if you'd like to change or add something please ask the Guild Manager, we'd be happy to accommodate if possible. If you would like to add a champagne toast or specialty cocktail, those items can be priced out for you by our Guild Manager as well. Alcohol from outside sources may not be brought in to the venue. The Guild requires all caterers be chosen from our list of exclusive catering services. Please see below. Here at The Guild Event Space, we hold ourselves to very high standards — especially when it comes to our guests' overall experience. We do not offer in-house catering; therefore, we have chosen these caterers that we believe uphold the same values and quality that The Guild stands for. We fully trust these vendors to take care of you and your guests while hosting an event in our space. You are not allowed to use any other outside caterers for events in our space. This Q&A section is intended to act as a catch-all for common questions pertaining to The Guild. If you can't find an answer to your question in the following drop-down menus, please contact us and we'd be glad to assist you. When does my set up time begin? Access time to The Guild varies depending on the day of the week. The Guild Manager can give you specific timing details, please email. The Guild venue features a bridal room and a groom room; you have access to those rooms as soon as your scheduled set-up time begins. If you have already booked, your timing information is listed in your contract. How does event time work? Your rental fee includes 5 hours of event time when you host a wedding reception and 6 hours of total event time if you host a ceremony + reception in our space (ceremony fee of $600 applies). If you’d like to extend your rental/event time, you may rent the space for one additional hour at a flat rate of $600/hr. Your event hours may begin whenever you’d like, but we ask that the event ends no later than 12:00AM. If your event goes until 12:00AM, last call will be made at 11:30PM. If your event ends prior to 12:00AM, last call is made 30 minutes prior to your end time. During your set up and event time, you have access to the bridal party suite, The Guild indoor space, lobby, loft and outdoor Guild Garden area. We allow up to 1 hour for load out after the end time of your event. The Guild staff will be on-site moving furniture and cleaning, so you will only be responsible for taking out any items that you bring in (this includes rentals, gifts, florals, signage, etc). We do not ask you to clean or move any furniture. Can my florist leave vases or decor? Caterer leave rentals? Everything must be out at the end of the night unless other arrangements have been made with The Guild Manager. Due to our high volume of events, we typically cannot store or keep things overnight. Do you have AV on-site? We do not offer AV on-site; that is typically something your DJ or band would provide. Our garden does have outlets for AV equipment if you choose to host your event outside. The DJ/band typically would provide a remote speaker/mic for outdoor use during a ceremony, but please be sure to ask them what equipment they have available. We do not allow loose glitter or confetti indoors or in the Guild Garden. We do allow real candles but they must be contained, as no open flames are allowed. Any décor you bring in must be removed the same night. The Guild does have three private lots available as well as ample street parking for your guests. Do I need an appointment to tour the venue? Yes. We ask that you contact our event space manager to set up a time to view the space in order to ensure that the space is available for visitors. You can schedule a tour by emailing info@theguildkc.com or calling 816-471-8550. We offer tours Monday through Friday but can be flexible on times. We do not offer weekend tours due to the high volume of events in our space. We want to give the bride & groom/ client of the day our full attention as we would give the same respect to you on your big day! Thank you for understanding. What furniture/items are included with the rental fee? We have 275 black folding chairs on site, 28 60” round tables, 6 6’ tables, 1 48" round table and 6 bar high tables; we provide linens for all of those tables (in black, white or ivory- floor-length). We also have 2 4x11’ farmhouse tables on wheels that you are welcome to use for your head table, catering, dessert, etc. If you’d like to add additional cocktail tables, we charge $10.50 per table (linen included). We will handle rental and logistics of these tables. We do not handle china, flatware or linen napkins on site; those items are handled through your caterer. Who sets up and breaks down the furniture? The Guild Staff will set up all tables, chairs and linens for you. Your layout will already be set up for you when your access time begins. The Guild Staff will also tear down tables, chairs and linens. You or your planner/florist/caterer/etc. are responsible for set-up and break down of any décor, china, flatware, and florals. We do not have in-house wedding planning services. We highly recommend that you hire a wedding planner for your big day. At minimum, a month-of coordinator is highly suggested! We have a list of wedding planners that we love and who know how to run an event in our space — please ask The Guild manager for suggestions. It is very helpful to have someone who is in charge of the ceremony processional, cocktail hour, transportation, timeline, etc., so that your day can be totally stress free. The Guild provides an on-site venue manager the day of your event. This person is responsible for anything venue related: letting vendors in, stocking bathrooms, managing the bar, moving chairs and closing at the end of the evening. How do you handle ceremony rehearsals? Due to the high volume of events here at The Guild, we do our best to accommodate rehearsals when possible. Most weddings on Friday can rehearse on Thursday (depending on the event calendar) and weddings on Saturday or Sunday can rehearse earlier in the day, the day before, or the day of their event. Some couples also choose to rehearse elsewhere. We do not charge a fee for rehearsals but time for use of the garden space must be coordinated with The Guild Manager. How do I book The Guild? We ask for half down of the base rental fee (your deposit total depends on the day of the week). No other payments are due until the month of the wedding/event. Do you have holiday fees/pricing? This depends on the holiday. Please ask The Guild manager if you are inquiring about an event on a holiday day/weekend. Where can I inquire regarding corporate bookings? Please e-mail us for information and considerations regarding corporate booking.